The present study was carried out in and around Gidole Town in Southern Ethiopia which is about 580km from Addis Ababa. The main objective of the study was to prepare a landslide hazard zonation (LHZ) map by using Bivariat statistical information value model and to assess the slope instability in the area by using InSAR approach. For LHZ six causative factors such as; slope, land-use/land-cover, slope-material, elevation, aspect, and Normalized Difference Vegetation Index (NDVI) were considered. For the sub-classes of these causative factors weights were obtained from the information value model. The results showed that very high hazard zones and high hazard zones covers 6.63% (14.12 km2) and 15.36% (32.72 km2) of the area, respectively. Whereas, moderate hazard, low hazard and very low hazard zones covers 7.47% (15.9 km2), 34.2% (72.85 km2) and 36.34% (77.4 km2) of the area, respectively. Further, validation of the LHZ map showed that 92.3% of the past landslides fall in very high hazard and high hazard zones. Thus, the hazard zones delineated in the present study has reasonably validated with the past landslide data and the potential zones depicted in the prepared LHZ map can be applied for the safe planning of the area. Further, the results of the PS-InSAR processing indicates that the average downward displacement in the study area is gradually increasing from 15.3mm/yr (2014) to −19.2 mm/yr (2018) and the rate of displacement in general increases with increase in the average monthly precipitation at all selected persistence scattered points. Study deals with landslide hazard zonation and slope Instability assessment using radar and optical data. 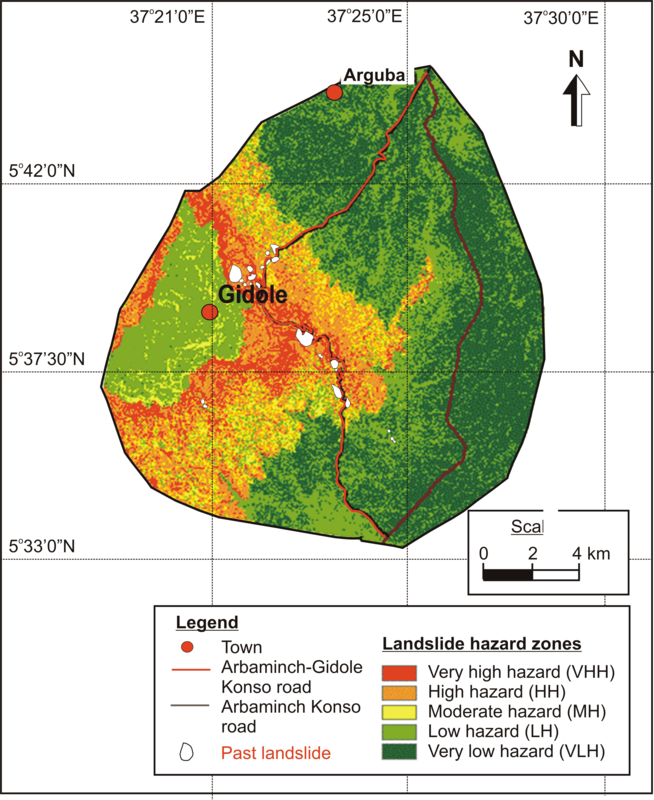 Bivariat statistical information value model was used for landslide hazard zonation. The results confirmed effectiveness of integrated bivariate statistical model and PSInSAR approach. The integrated approach is helpful in mitigation of landslides.